NAD C 568 review | What Hi-Fi? It gives us great pleasure to note that the CD disc isn’t dead yet. But despite that, it doesn’t go unnoticed that the ratio of ‘in vogue’ sources (turntables and music streamers, for example) to CD players that enter our test rooms these days isn’t too dissimilar to the proportion of students to teachers in a classroom. So we’re pleased to welcome the NAD C 568, especially since its midrange price point is rather unpopulated with players we can heartily recommend. Top and tailing it, however, are two very commendable models: the Marantz CD6006 (£280) and Cyrus CDi (£925) – our current Award winners, no less. So can the NAD occupy the rather sparse and barren land of the middle range CD player? We hook up the NAD via its line-level outputs (there are optical and coaxial digital outputs too), watch the disc close on Bon Iver’s 22, A Million album. We then turn the responsive control dial to track three: 33 God. It’s a track laden with as many intricacies as obscurities, and the NAD takes them all in its stride, allowing the colourful synth textures to materialise. It serves them on a tonally even platter and reaches a level of ‘easy listening’ that would make Sinatra proud. Warmth oozes through Justin Vernon’s high-pitched vocal, and it does likewise for the piano harmonics. We’d call the NAD’s sound pleasant, but despite the positive connotations, it’s not generally the word you might want to describe your perfect hi-fi performance. Unfortunately, the NAD can easily appear cramped – something Bon Iver’s dense synths all too boldly highlight. The Marantz CD6006 is considerably more liberal in its approach, not only giving music more breathing space, but also allowing it more dynamic freedom. Through the NAD, drums feel like they’re fighting the synths for space in a soundstage that ultimately lacks dynamic range and spatial awareness. Don’t get us wrong, the NAD has scale and power, which is laid bare as the choir contribution on the Hell or High Water soundtrack generously fills our test room. It simply seems to ignore white space on the canvas. It doesn’t go out of its way to sound overly enthused with your music choices, either. There’s a definite “yee haw” expression of giddiness missing from the exuberant acoustic finger plucking in Towne Van Zandt’s Dollar Bill Blues. The Marantz, meanwhile, gives the song a much-needed lift. 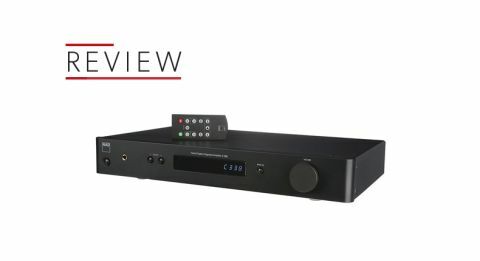 Admittedly, the Marantz is a remarkable CD player for the money, but at twice the price of the CD6006, we would still expect a more engaging, competitive performance from the NAD. However, it is a dynamic flourish, helping of space and double espresso shot away from offering it. On the plus side, the C 568 is suitably equipped; it not only has optical and coaxial digital outputs but a USB input for playback too. It’s easy to use too, both in regards to on-unit control and the full-sized, intuitive remote. Unfortunately, it’s mostly about the performance and not even a decent spread of connections can be the NAD’s saving grace here. The CD player market isn’t as saturated as it was 15 years ago, but our expectations shouldn’t be lowered by the dwindling choice. The bar is still being set high by other players and at £600, the NAD C 568 simply doesn’t meet ours. It’s back to the drawing board for NAD.